Do you want straighter teeth, but don't want to sacrifice your smile to braces? Dr. Allen Garai has been recognized as "one of the leaders in lingual orthodontics in the Washington area" by Washingtonian magazine. He specializes in lingual "hidden" braces and other "invisible" orthodontic solutions for patients in Vienna, VA and the surrounding Washington D.C. metropolitan area. 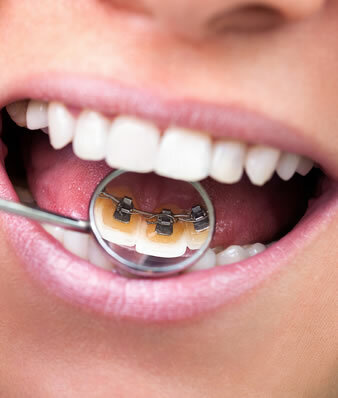 With this specialized treatment, no one but you will know that you have braces. He has more than 17 years of experience in treating patients with lingual braces and has been teaching lingual orthodontics at Childrens/Washington Hospital Center Department of Orthodontics since1998. Dr. Garai has been featured in NBC 4, A New Me and News Channel 8. Concealed braces, also known as lingual, "hidden" or invisible braces, are the best and only non-visible form of fixed orthodontic therapy. Invented by Dr. Craven Kurz in Beverly Hills, lingual braces are truly a reliable form of orthodontic therapy by utilizing principles similar to those of traditional braces. We offer the latest innovations in Lingual Orthodontics in our iBracesVIP Centers (The Center for Invisible Braces) in Vienna and Great Falls. We are the premier lingual orthodontic practice in Northern Virginia! Since lingual braces are practically invisible, people are concentrating on your smile and not your braces. In fact, very few people will notice unless you tell them. Why sacrifice your smile just to get the straighter teeth you've always wanted? Schedule a consultation with Dr. Garai today. We have two convenient orthodontic office locations: Great Falls and Vienna, VA and serving patients from Washington, D.C., Maryland and greater Northern Virginia (Fairfax and Loudoun). Dr. Garai has been treating patients with lingual hidden braces for over 15 years and has been teaching lingual braces to other orthodontic residents for over 10 years. Garai Orthodontic Specialists serves patients of all ages from Vienna, Great Falls, Arlington, Alexandria, Mclean, Tysons Corner, Fairfax County and Loudoun County. For Incognito, Harmony braces, or STb Ormco lingual braces, contact one of our Northern Virginia orthodontic offices today to schedule your complimentary consultation!